I’m sure Mike didn’t intend this harmless tweet to occupy my thoughts but for the last week or so, it has. I’ve long thought it would be very cool to build my own plane, I’m generally useless with my hands so have dismissed it (especially after reading the logs of some Van’s RV builders) but the STOL 750 from Zenith looks real simple to build, and in the aviation scale of things, fairly inexpensive. I figure it would take us 2 years or more to complete (unless I can get a job that has me living at home during the week) and I have no idea how I’d finance the panel or the engine at this point, though I am sure at that stage of the process nothing would stop me! 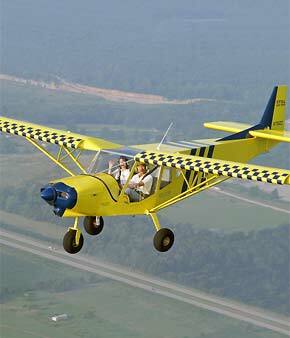 The 750 is a Light Sport Plane and therefore doesn’t require a valid FAA medical to fly it. Sport pilots aren’t allowed to fly at night or in IFR but as an IFR-rated Private pilot I would be allowed to fly it in those conditions if the manufacturer’s operating conditions allow it. I’ve no idea if they do right now, though they do have an IFR-certifiable kit plane in the 650 so maybe it’s not beyond the realm of possibility. I’m not sure if I’d want to fly IFR in this type of plane (too light, too slow), but night flight would definitely be desirable. What about that inexpensive part? You can buy the complete kit (which for some reason isn’t complete, you need a finishing kit too) for $14.5k which won’t include the engine, the pointy thing at the front or the instrument panel. The good thing is that you can buy it in sub-kits enabling you to “pay as you go”. This adds to the cost but does at least soften the blow, though if I had somewhere to store it I’d be tempted to drive to Mexico, MO and get the whole thing at once. The really cool thing is that you can “try before you buy” by purchasing the rudder kit for $400. They say that if you can successfully complete the rudder then you are very likely able to build the whole thing. So I’m tempted to get that and see what I think – could I really build my own plane? Looking at the regulations, it almost looks like building it is the easy part but I’m sure once you have an airframe built there’s little chance a little FAA paperwork is going to stop you. For now I’ve ordered the introductory materials from Zenith and this DVD on metalworking 101 which demonstrates the rudder assembly so I can see exactly what I’d be getting into. Once I’ve looked at these things, we’ll have another think. Author adminPosted on June 22, 2010 Categories Miscellaneous1 Comment on Build My Own Plane?